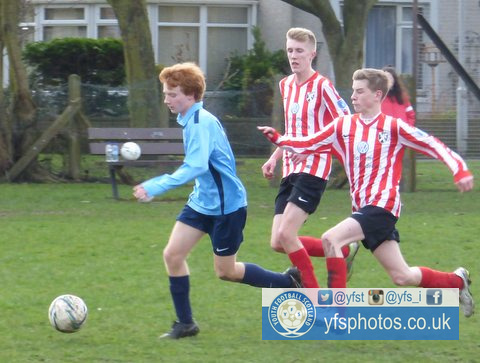 Riverside CSC claimed victory against St Andrews Colts after netting a devastating 13 goals. Jamie Thomson scored an outstanding five goals while Jack Pollock netted four. Ryan Lonie, who had started of the scoring, grabbed himself a double in the game whilst Scott Crosbie and Michael O’ Rourke scored a goal each for themselves. All in all it was an impressive display from the boys in blue. St Andrews began the game on the back foot, as they were only able to field ten players. For Riverside, their attacking intentions were clear from the get go as Thomson broke through the St Andrews defence in the first minute of the game. He took a low hard shot but was denied by Callum Reid, in goal, who saved well. Reid was tested shortly after when Ryan Lonie drove into the box and looked to curl his effort into the far corner. The ‘keeper was once again able to parry the ball out and it was eventually cleared. In the fifth minute of the game, however, Riverside opened the scoring. After some neat interplay on the edge of the box Lonie was eventually played through beyond the defence. His initial shot was saved well by Reid but Riverside’s number 12 quickly dispatched the rebound to make it 1-0. Riverside came close to adding a second three minutes afterwards when Andrew Balmer met a corner kick with his head. The resulting header looped up and landed onto the crossbar before bouncing out of play. Afterwards it was Jack Pollock’s turn to go close. Lonie fired in a great cross from the left wing, which found Pollock just a few yards from goal. The number 10, somehow, managed to fire his shot up and over the crossbar. As the game ticked into the 17th minute Riverside found themselves 2-0 up. Pollock picked up the ball and fired a shot towards the bottom left hand corner. Despite Reid managing to get a hand to it the ball still managed to find its way into the net. Ten minutes later St Andrews managed to create an opportunity for themselves. Jack Ovenstone made a fine run down the left hand side before laying the ball off to Kai Gately. The number 8 then fired a cross into the box but, unfortunately, it flew just over the head of the oncoming Josh Ingram and went out of play. In the 31st minute of the match the third goal was scored. Jamie Thomson fired in a great cross from the right hand side where it was met by Pollock. The number 10 slotted the ball home with a neat first time finish. Three minutes later Riverside scored their fourth. Thomson latched onto a through ball from Lonie and found himself in a one on one situation. He managed to successfully slot the ball past the oncoming goalkeeper to grab the first of his goals. Shortly after and Thomson had his second and Riverside’s fifth. Once again Ryan Lonie was the supplier from the left wing as he floated in a cross towards Thomson, who was waiting in the box. The number 11 successfully headed the ball into the back of the net from six yards out. A minute after the fifth goal came the sixth. After a defensive mix up for St Andrews Pollock was able to latch onto the loose ball and calmly place the ball into an open goal. As the half time whistle came Riverside found themselves in a dominant position. Riverside began the second half in a similar vain to the first except, this time, the reward was goal number seven. Thomson made a great driving run through the defense before attempting to lay the ball of to a teammate. The ball, however, found its way back to him and he wasted no time in rifling it into the top left hand corner of the net. In the 43rd minute Thomson grabbed another goal to make the score 8-0. After winning a foot race against Jordan Wilson he managed to gain possession of the ball with just the goalie to beat. Thomson expertly slotted the ball round the keeper and in. Shortly after Scott Crosbie decided it was his turn to get in on the act. Thomson turned into the supplier this time as he broke through the St Andrews back line. He then layed the ball off to Crosbie who had joined the attacking move. With the defence all at sea Crosbie comfortably converted to score Riverside’s ninth goal. In the 50th minute of the game Thomson netted his fifth goal and riverside’s tenth. Once again he was able to break free of the defence and expertly side footed the ball through the goalkeepers legs and into the back of the net. The game started to loose a bit of the intensity as the next opportunity did not arise until the 70th minute in which Riverside got their eleventh. Pollock made a great run down the right hand side and crossed the ball into the box. Ryan Lonie was waiting to pounce and he managed to convert the ball successfully to increase the score line ever further. A minute later Michael O’Rourke claimed a goal for himself. After finding his way into the penalty area with possession of the ball he unleashed a fierce strike at goal. Reid did well to save the initial shot but O’Rourke followed up on the rebound. The number 4’s second shot hit Reid’s leg and bounced into the back of the net. In the 74th minute David Martin came close to getting a goal when he managed to meet a corner kick with his head. The resulting effort, however, rattled onto the crossbar and was cleared. A minute later, however, Pollock grabbed his fourth of the game. He managed to gain possession on the right and drove towards goal before successfully firing the ball into the back of the net to make the score 13-0. The referee soon brought an end to the game that Riverside can, understandably, be proud of. Not only was their goal scoring impressive but they also kept emphasizing the same message throughout: to continue playing neat passing football on the ground. If anything their style of play was as impressive and is something that is great to see. For St Andrews Colts they have to take this in their stride. Defeats such as this are the best way to learn and the group will only get stronger from these experiences. They also won’t have to contend very often with a number of their players going off to watch Dundee United v Celtic cup finals to leave them shorthanded. Callum Reid – Despite the score line it could have been a lot worse without the performance of St Andrews goalkeeper. Made some very good saves in the game. Jamie Thomson – Five goals is hard to beat really isn’t it? Was great throughout and also notched a few assists along the way. 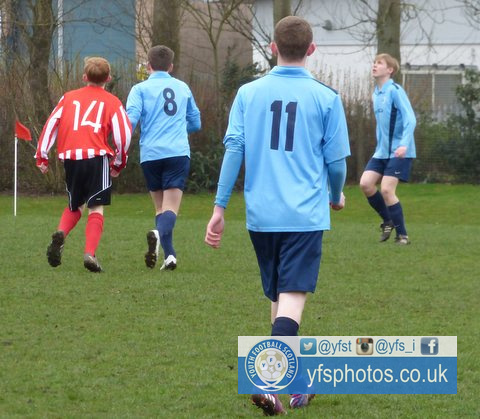 Worthy mentions go to Jack Pollock for netting ‘only’ four goals and Ryan Lonie who was a hugely creative influence. Callum Reid’s early saves were all tough ones to make but he managed successfully. Some good goalkeeping. Large selection of goals to choose from but I’m going to go for Thomson’s fifth goal on 50 minutes. The audacity to slot the ball through the ‘keepers legs isn’t something most would be comfortable in doing. Great to see though.